Local customers rely on a lot of different methods to find local businesses. The ways customers use to find local businesses are as unique as the customer is too! My preferred method might be to go to Yelp first but someone else’s preference might be to search Google. If you do business locally and want local customers to find you online, some things you can do to show up in your customers path better. Making sure customers know where to go is essential to your survival. Knowing where you need to be to help customers find your business online is also essential. Almost every journey you take to grow your business online should start with knowing your goal. Just like starting your blog, creating goals for helping customers find your business is no exception. What you want out of your online brand and your local presence is something you need to decide in the beginning. There are some important questions you need to ask yourself before you put time into creating profiles, writing information, creating accounts, etc. This question can usually be answered by understanding the demographics of your customer. If your customers are in their 20’s then the best place to reach them isn’t the same as if they’re in their 40’s. If you try to target the wrong platform online then you’re wasting your time. If you try to cover all platforms online then you’re also wasting your time (there are a lot). If you haven’t interviewed any of your customers directly, you may have to rely on general industry research. Sometimes observation can be helpful too. If you’re a local business then you can see who is coming into your business. That will tell you a lot without having to go through a lot of research. That means you need to find out what you want your customers to do after finding you. You can’t expect to give customers 10 options and have them choose one. Your customer’s first interaction with your business will be overwhelming if you give them too many options. Out of all the types of interactions a customer could have with your business, you need to choose the most important to you. Figure out the one action you want them to take and make sure that’s the most prominent and easiest for them to get to. Do you want customers to drive to your business? Do you want them to call you? Is there a form they should fill out? These questions will help you answer what you want your customer to do. Now that you have this question figured out, it’s important to know the places you could be found. There are new platforms released every day for your business to be found on, too many to keep up with. Niche apps are on the featured list in the app store every day for finding local businesses of a specific type. There are search engines that some customers use to find local businesses too. Search engines are getting better at surfacing local results every day too. Google is putting a lot of resources into bringing great local results to their customers, and so is Bing. Both Google and Bing have a business pages platform that lets your business be found easily by local customers searching for your type of business. Search engines don’t cover all the possibilities where a customer could find you, though. Many people use local directory services to find customer ratings, locations, and information about local businesses. Some groups of customers might use Yelp, some Foursquare. Even Facebook is getting in on local business search and directories action! The best way to make sure your business is everywhere local consumers are looking is to be everywhere. A local business directory management service will make that an easy process for you and will pay for itself. In addition to the major directories and searches, there are many specialties too. Angie’s List is a popular one but there are many others also. If you’re a restaurant then the most obvious places to put yourself where your customers are online is on Yelp and Foursquare. If you’re in construction then Angie’s List is a great place. Every business is unique and every customer is unique too. The important thing is to keep in mind that every customer’s journey is unique. The challenge is figuring out what that journey is and putting yourself on the path. Not all businesses need to be in the path of local customers for their business, though. There are some helpful questions you can ask to figure out if you really need to target local customers. This is a question I grappled with in the beginning because of the nature of my business. I don’t have a physical shop or office nor will I ever have one. I do however do business on many levels of locality (local, national, international). There are some cases where it’s a no-brainer that you need to find local customers. If you only do business locally then your local presence is your most important presence online. Where it becomes blurry is when you do not have a physical local presence and your business is primarily done online. If you’re in this situation then you need to ask yourself if you want to meet with customers at their site or keep it all online. If you want to keep it online only then you don’t need to worry about local directories or local search (with one exception). 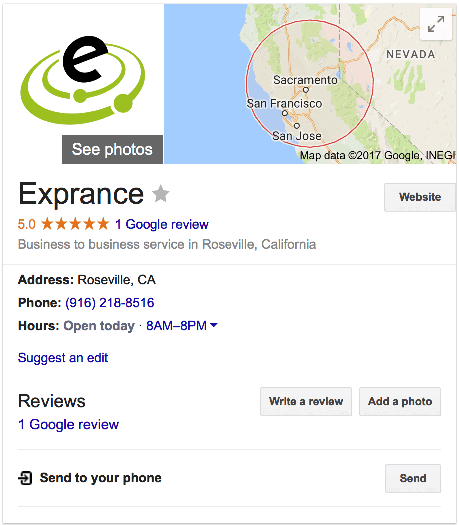 The one exception: A Google My Business Profile which is used for local results but it also gives you a better-defined search presence on Google for your business name. If you’ve decided a local presence is important to your business, there are a few things that are a must. Every local business needs to at least be seen on a few platforms. Beyond setting up profiles that show off your business, your website needs to be effective at telling people that you have a physical location. We’ll start with what you need to make sure the right information is available on your website so customers know about your business. Directories don’t look at your website because the directory houses most of the information on their website. Search engines, on the other hand, offer local results to customers and don’t contain as much information or they supplement their info with info from your website. For this reason, it’s important to make sure your business address and other contact information is available in a visible and prominent place on your website. Your address should be consistent everywhere online too. If your business has multiple locations, each one should have its own unique page. Not only should each location have a unique page, that page should have unique content on it that provides information to customers on what services that location provides. For instance, a copy center such as FedEx Kinko’s does a lot of different things depending on the location. Some sites might offer a notary public but others might not. Some could offer bookbinding while other sites do not. This information should be clear on each specific page to be as helpful to your customer as possible. Being helpful to the customer means search engines will also see your website as helpful therefore boosting its presence. Beyond your own website, there are other platforms that are necessary to set up your business on. Setting up local profiles on various platforms remains unique to each industry. There are several platforms that are a must though. The most important is Google Business Pages because it ties in closely with Google search results. The other platform is Bing Pages because it’s the 2nd most popular search engine and is used by people no matter what service they might be seeking out. If you don’t want to worry about managing each one of these, we can help by managing your local business listings for you. Make sure you know your customer demographic and then seek out the services they use to find you. You can even ask where people found you and then increase your presence there! Have fun building your local business online and find lots of local customers. If you have any questions I’m always available to chat on this website or by emailing me.